~Beautiful Waterfront Condo~ Last Minute Specials for April 2019! Book Now. Beautiful Waterfront Condo Any Week in October or November 2018 at Special Rate of Just $700/week, plus taxes & fees! There are moments that you wait for and you dream of all your life. Staying at the Bella Lago Penthouse #544 is one of those moments. Here you'll build memories with family and friends that will last a lifetime. When you enter this corner penthouse condo, you'll immediately notice the detail and grandeur. Trayed ceilings, Corian counters, and custom wood cabinets are just a few of the carpentry details that will be surrounding you during your stay. This unit has been designed to let the ocean breezes and sunlight surround you, providing you with peace and tranquility. 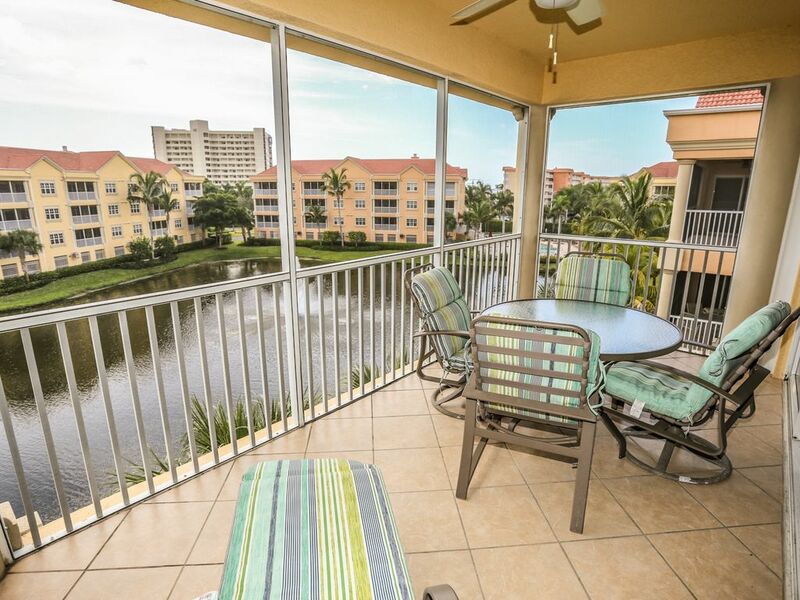 Enjoy the views of the Gulf of Mexico, the over-sized swimming pool and hot tub from this 4th floor unit. Located less than 100 meters from the pristine seven-mile stretch of white sugar sand beach, that's perfect for swimming, shelling, sand-castles and breathtaking Gulf of Mexico sunsets. Built in 2006, this 1950 square foot, 3 bedroom, 2 full bathroom top floor, corner condo offers wireless internet, an elevator, gym, gas grilling area, tennis courts, secured indoor parking, central air conditioning, ceiling fans, entertainment center with DVD, stereo, three cable TV's, and full size washer and dryer in the unit. The spacious kitchen overlooks the dining room and living room out towards the lake and golf course. It is fully stocked with new appliances, Corian countertops, all cookware, dishes, glassware and utensils. Here you'll find everything you need to prepare quick lunches or gourmet dinners. Relax in the large, bright living room decorated in soft earthy pastel shades, and tropical furnishings. The living room boasts a 20 foot wall of sliding glass doors, leading to the large screened in lanai. Reconnect with family and friends or watch your favorite show on the large 50" flat screen TV. The couch converts to a sleeper sofa for an additional sleeping area for 2 persons. Maximum occupancy of this condo is limited to 6 people total. The large lanai is a great place for a casual lunch, a romantic candlelit dinner or your afternoon siesta. The view from the lanai is tantalizing. Here you can see for miles, taking in the Gulf of Mexico, Bay Beach golf course, the Lake below, the pool and spa and the island of Fort Myers Beach. The enormous master suite boasts a king size bed, queen sleeper sofa, his and her walk-in closets, and private ensuite bath. Watch a late night movie on the in-room TV or slip out to the lanai from your private sliding glass door to enjoy the night views of the island. The bathroom is masterpiece with a splendid large soaking tub, separate oversized shower and his and her sinks. The second bedroom has two twin beds. The third bedroom offers a queen size bed and in-room TV. The guest bedrooms share a separate full bathroom. New high end mattresses we purchased in the spring of 2014. Only a stones throw from the beach, this condo is the perfect venue for special occasions like birthday and anniversary celebrations, weddings, family reunions, small business retreats, or a great family vacation. A no smoking, no pet policy has been implemented for the health and comfort of all guests. There is a large in-door gym, equipped with various weight machines and exercise equipment, along with large screen TV's. In addition, for medium sized gatherings there is also a beautiful, large community room, which is located poolside, that can be rented for a nominal fee of $25.00. Here you can host your gathering, in the comfort of a large open room, and enjoy the pool, hot tub, grilling area, and full kitchen. This is a great option for family gatherings, small weddings, and get-togethers. For those of you who want a truly relaxing vacation, we offer full concierge service, daily housekeeping and turn down services. Let us know how our concierge can assist you. We can arrange for special occasion items to be waiting for you, or that special someone in your party, upon your arrival. Groceries, fresh fruit baskets, floral arrangements, limo/dinner packages, an in-house massage, are all things that we can arrange for you to make your vacation ultra special. Catering of your special event can also be arranged. Do you need a crib or high chair for a little one? Kayaks to explore Estero Bay with? Golf clubs so you don't have to bring yours? Let us know. We offer a full rental department for those special items that you may need or don't want to bring with you. Everything is delivered to you for your arrival and picked up on the day of your departure. So you can relax on your vacation in paradise. Thank you for taking the time to write us a 5 star review! We are happy to know that you enjoyed your family vacation. We look forward to hosting your next visit to Fort Myers Beach. Beautiful condo in the perfect location! We had a wonderful experience staying at Bella Lago! The condo is beautiful, beds couldn't be more comfortable, pool is clean and it is in the perfect location. We came during Spring Break so the island was packed but we loved being on the quiet end. Our 16 year old girls took the trolley down to the north end for shopping/lunch and we used it for a night out. There are nice restaurants and stores within walking distance, you don't really even need a car. Don't forget to look in the storage unit for beach chairs and toys, it had everything we needed! We will definitely stay here again. We had a great visit! The condo is spacious, clean, bright and airy, and well-appointed (many items looked new). I can't wait to go back! The pool and hot tub are nearby and the beach is easily accessible via the pedestrian crosswalk - although the condo is so comfortable, it's tempting to open the sliding door to the screened lanai and just relax there. We had a wonderful time. The condo is absolutely lovely and well appointed. The 180 degree view is spectacular, and the pool is very close by and there were lots of available lounge chairs. It is the perfect vacation spot for couples or families. My family had the most wonderful time. Start of some great family memories. Hope to go back every year.